PVR Cinemas is a film entertainment company in India. The company, which began as a joint venture agreement between Priya Exhibitors Private Limited and Village Roadshow Limited in 1995 with 60:40 ratio, began its commercial operations in June 1997. The company is founded by Ajay Bijli, who is the Chairman and Managing Director. Ajay Bijli's brother Sanjeev Kumar Bijli is the Joint Managing Director of PVR Ltd. The company also operates a pro-active CSR wing under PVR Nest. The company has its origin as Tejas dhawan in South Delhi, which was bought by Ajay Bijli's father in 1978, who also owned a trucking business, Amritsar Transport Co. In 1988, Bijli took over the running of the cinema hall, which was revamped in 1990, and its success led to the founding PVR Cinemas. In 2003., ICICI Ventures invested Rs 40 crore in PVR when Village Roadshow decided to pull out of the partnership. In 2012, Kanakia group owned CineMAX cinema chain was bought by Cine Hospitality Private Ltd, a subsidiary of PVR Cinemas for ₹395 crore (US$55 million), making PVR the largest cinema chain in India. In May 2016, DLF group owned DT Cinemas was bought by PVR Cinemas for ₹433 crore (US$60 million). From PVR’s Gold Class and Mainstream Cinemas, Director’s Cut to the latest format- PVR Icon, the company has made exceptional technology like the IMAX® and the ECX (Enhanced Cinema Experience), 4 DX accessible to its audience. Recently PVR Cinemas ventured into a new cinema concept- Superplex in Noida. 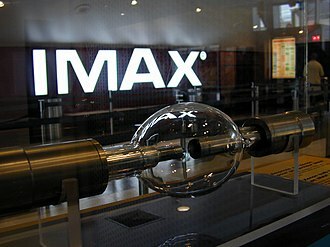 The cinema have 15 screens with IMAX, 4DX, Gold Class, Playhouse(Specially for Kids) and mainstream auditoriums. PVR Cinemas has invested ₹48 crores in this new venture. PVR's first "Gold Screen" was launched in Indore in 2007. Recently, PVR Cinemas in association with HP India has launched Asia’s first Virtual Reality (VR) Lounge at PVR ECX, Mall of India, Noida. In August 2018, PVR Cinemas announced their acquisition of Chennai based Sathyam Cinemas for 850 crores in a cash and stock deal. PVR has a strong presence with 754 screens in 162 locations across 64 Indian cities. PVR's 4DX is the second cinema chain in India to introduce 4DX in the country after Cinepolis. PVR has signed 21 theater agreement with 4DX which is the largest in the country out of which 14 are open. One each in Hyderabad, Pune, Ahmedabad, Surat and Chandigarh, three in Bangalore, ,four in NCR and two in Mumbai where as three more coming up by end of the year at Ludhiana, Pune and Kolkata, NCR among other. ^ "Questions & Answers: Ajay Bijli". Wall Street Journal. 24 November 2009. Retrieved 2014-09-24. ^ Peerzada Abrar (24 August 2012). "How Ajay Bijli, the man behind PVR, managed to crack the movie theatre business in India". The Economic Times. Retrieved 2014-09-24. ^ "PVR bought Cinemax for Rs 395 cr, becoming country's largest multiplex". Firstpost. 29 November 2012. Retrieved 29 November 2012. ^ "PVR Acquires 69 percent Stake in Cinemax for 395 Crores". Biharprabha News. 30 November 2012. ^ "PVR acquires DLF's DT Cinemas for Rs 433 crore". Times of India. July 31, 2016. Retrieved 25 July 2015. ^ Urvi Malvania (11 February 2015). "Coming soon: Multiplex boom across India". Business Standard. Retrieved 25 July 2015. ^ "Indias thirst for gold hits cinemas". Financial Times. Retrieved Nov 8, 2016. ^ "अगले साल शहर को और तीन मल्टीप्लेक्स का तोहफा- Amarujala". Amar Ujala (in Hindi). Retrieved 2018-10-12. Dhanbad is a city in the Indian state of Jharkhand, India. It is the second most populated city in Jharkhand, Dhanbad along with its urban areas population ranks 42nd in population amongst other cities in India. Dhanbad is famous for its mining, has some of the largest mines in India and is called Coal Capital of India. Tata Steel, Bharat Coking Coal Limited, Eastern Coalfields Limited, the IIT, Dhanbad is located in Dhanbad. Among the rail divisions of Indian Railway, Dhanbad Rail Division is the second largest in terms of generation after the Mumbai division. The city has one seat and six seats in the Legislative Assembly. The Dhanbad originated from the district of Manbhum occupied by Mundari or Kolarian races in the wilderness of South undivided Bihar, in the seventh century A. D. some information is available from the account of the travels of Hieun Tsang. 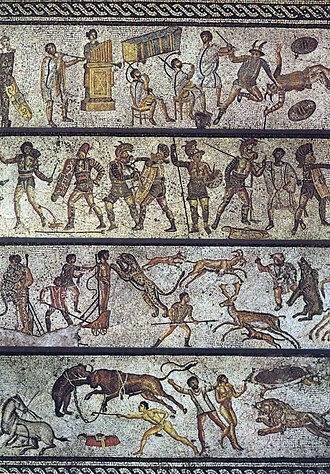 These accounts narrate existence of a kingdom which comprised the district and adjoining areas. Manbhum was one of the districts of the East India during the British Raj, after India’s independence, the district became a part of Bihar state, and upon re-organization of the Indian states in the mid-1950s, the district became a part of the West Bengal. 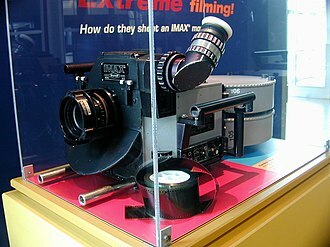 4DX is a motion picture technology owned and developed by South Korean company CJ 4DPLEX, a part of the CJ Group. 4DX allows a motion picture presentation to be augmented with environmental effects such as motion, rain, lights. As such, theaters must be designed for and equipped with 4DX technology. The experience was introduced commercially in 2009 with the release of Journey to the Center of the Earth in Seoul, 4DX was launched by South Korean theater chain, CJ CGV with the release of New Line Cinemas Journey to the Center of the Earth in Seoul in 2009. In 2010, after the success with the 4DX screening of Avatar. 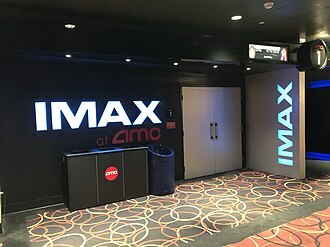 On 2 June 2011, Mexican cineplex company, Cinépolis, have invested $25 million, the company opened its first room in Guatemala on 17 December 2013, with the release of The Hobbit, The Desolation of Smaug, as the first 4DX theater in Central America. The company opened its first 4DX theater in India in 2014, in Costa Rica, the company is set to open its first 4DX theater on 14 September 2014 with the release of The Maze Runner. In 2012, CNN Travel named the CGV Gangbyeon 4DX theater as one of the worlds best movie theatres. The Paramount Pictures film, Dark of the Moon, has opened new 4DX rooms at Major Cineplex on 19 June 2011 in Thailand and Cinema Park on 22 December 2012 in Russia. Cinema City has opened its first 4DX room in Israel on 19 July 2012 at the Yes Planet Rishon Lezion theater, the company opened new 4DX theaters throughout Europe. On 26 April 2013, Japanese cineplex chain, Korona World, opened its first room in Nagoya, on 6 May 2013, CGV released a new 4DX trailer, starring Lee Byung-hun. On 12 June 2013, Taiwanese cineplex chain, Vieshow Cinemas, has opened its first room with the release of Man of Steel, on 19 July 2013, Cine Hoyts opened its first 4DX room in La Reina, with the release of Turbo. As of August 2013, the 4DX technology has achieved over 10,000 seats in 16 countries and 58 cities, on 23 August 2013, Indonesias Blitzmegaplex opened its first 4DX theater with the release of Percy Jackson, Sea of Monsters. Noida, short for the New Okhla Industrial Development Authority, is a systematically planned Indian city under the management of the New Okhla Industrial Development Authority. It is part of National Capital Region of India, Noida came into administrative existence on 17 April 1976 and celebrates 17 April as Noida Day. 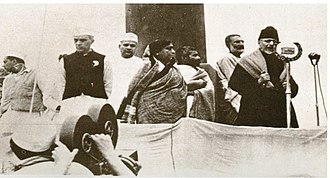 It was set up as part of an urbanisation thrust during the controversial Emergency period, the city was created under the UP Industrial Area Development Act by the initiatives of Sanjay Gandhi. The city has the highest per capita income in the whole National Capital Region, the Noida Authority is among the richest civic bodies in the country. 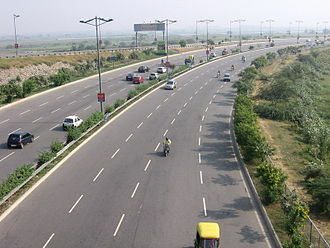 As per provisional reports of Census India, the population of Noida in 2011 is 642,381, roads in Noida are lined by trees and it is considered to be Indias greenest city with about 50% green cover, the highest of any city in India. Noida is located in Gautam Buddh Nagar district of Uttar Pradesh state, the districts administrative headquarters are in the nearby town of Greater Noida. However, the districts highest government official, the District Magistrate, has its official camp office in Noida Sector-27, the city is a part of the Noida Vidhan Sabha constituency and Gautam Buddha Nagar. Minister of State for Culture, Tourism of Civil Aviation Mahesh Sharma of the BJP is the current MP of Noida, the current MLA is Pankaj Singh. Noida has emerged as a hot spot for IT and IT-enabled services industry with large companies setting up their businesses here. Noida is located in the Gautam Buddh Nagar district of Uttar Pradesh state India, Noida is about 25 kilometres southeast of New Delhi,20 kilometres northwest of the district headquarters - Greater Noida and 457 kilometres northwest of the state capital, Lucknow. Noida falls under the catchment area of the Yamuna River, and is located on the old river bed, the soil is rich and loamy. Since Noida can be termed as being situated on the tail of Aravali, other common trees are Neem, Banyan and Teak that grow naturally. Recent urbanisation has introduced laburnam, red cotton, and other trees on the roadsides, people take a lot of interest in planting amaltash and Gulmohar. Connaught Place is one of the largest financial and business centres in New Delhi, India. It is often abbreviated to CP and houses the headquarters of several noted Indian firms. The main commercial area of the new city, New Delhi, during the erstwhile British Raj and it was developed as a showpiece of Lutyens Delhi with a prominent Central Business District. Named after Prince Arthur, 1st Duke of Connaught and Strathearn, a metro railway station built under it is named Rajiv Chowk. Prior to the construction of Connaught Place, the area was a ridge, covered with trees and populated with jackals. Residents of the Kashmere Gate, Civil Lines area visited during the weekends for partridge hunting, the Hanuman Temple attracted many visitors from the old walled city, who came only on Tuesdays and Saturdays and before sunset, as the return trip was considered dangerous. Residents of villages including Madhoganj, Jaisingh Pura and Raja ka Bazaar were evicted to clear the area for the construction of Connaught Place and the development of its nearby areas. The villages were situated along the historic Qutb Road, the main road connecting Shahjahanabad. The displaced people were relocated in Karol Bagh to the west, three structures were spared demolition. These were Hanuman temple, a Jain temple in Jaisinghpura and the Jantar Mantar, plans to have a central business district were developed as the construction of the new capital of Imperial India began to take shape. Headed by W. H. Nicholls, the architect to the Government of India. Connaught Places Georgian architecture is modelled after the Royal Crescent in Bath, the circle was eventually designed with two concentric circles, creating an Inner Circle, Middle Circle and the Outer Circle with seven roads radiating from a circular central park. As per the plan, the different blocks of Connaught Place were to be joined from above, employing archways. However, the circle was broken up to give it a grander scale, even the blocks were originally planned to be 172 metres in height, but reduced to the present two-storied structure with an open colonnade. Ranchi is the capital of the Indian state of Jharkhand, and now it is the most populous city of the state. The Jharkhand state was formed on 15 November 2000 by carving out the Bihar divisions of Chota Nagpur, the name Ranchi is derived from the previous name of the Oraon village at the same site, Archi. Archi derives from the Oraon word for bamboo grove or stave, according to legend, after an altercation with a spirit, a farmer beat the spirit with his bamboo stave. The spirit shouted archi, archi and vanished, Archi became Rachi, which became Ranchi. One of the historically significant neighbourhoods of Rachi is Doranda, Doranda lies between the Hinoo & Harmoo Rivers, where the civil station and church established by the British Raj were destroyed by rebel forces during the Sepoy Mutiny. Ranchi has been selected as one of the hundred Indian cities to be developed as a city under PM Narendra Modis flagship Smart Cities Mission. Ranchi is well known for being the hometown of former Indian cricket captain MS Dhoni, Ranchi lies at 23°22′N 85°20′E near to the Tropic of Cancer. Its municipal area is 175.12 km2, and its elevation is 651 m above sea level. Ranchi is located in the part of the Chota Nagpur plateau. Ranchi has a topography and its dense tropical forests a combination that produces a relatively moderate climate compared to the rest of the state. However, due to the deforestation, and development of the city. Although Ranchi has a subtropical climate, its location and the forests surrounding it combine to produce the unusually pleasant climate for which its known. Summer temperatures range from 20 °C to 42 degrees, winter temperatures from 0 °C to 25 degrees and January are the coolest months, with temperatures dipping to the freezing point in some areas. The annual rainfall is about 1430 mm, from June to September the rainfall is about 1,100 mm. The Köppen Climate Classification subtype for this climate is Cwa, as of 2011 India census, Ranchi municipal corporation has a population of 1,120,374, making it the 46th largest urban city in India. Males constitute 51. 3% of the population and females 48. The National Stock Exchange of India Limited is the leading stock exchange of India, located in Mumbai. NSE was established in 1992 as the first demutualized electronic exchange in the country. National Stock Exchange has a market capitalization of more than US$1.41 trillion. NSEs flagship index, the NIFTY50, the 51 stock index, is used extensively by investors in India, only about 4% of the Indian economy / GDP is actually derived from the stock exchanges in India. NSE was set up by a group of leading Indian financial institutions at the behest of the government of India to bring transparency to the Indian capital market. Based on the laid out by the government committee, NSE has been established with a diversified shareholding comprising domestic. The key domestic investors include Life Insurance Corporation of India, State Bank of India, IFCI Limited IDFC Limited and Stock Holding Corporation of India Limited. And the key global investors are Gagil FDI Limited, GS Strategic Investments Limited, SAIF II SE Investments Mauritius Limited, Aranda Investments Pte Limited, NSE offers trading and settlement services in equity, equity derivatives and currency derivatives segments. It is the first exchange in India to introduce electronic trading facility thus connecting together the investor base of the entire country, NSE has 2500 VSATs and 3000 leased lines spread over more than 2000 cities across India. NSE commenced operations in the Wholesale Debt Market segment in June 1994, the capital market segment of the NSE commenced operations in November 1994, while operations in the derivatives segment commenced in June 2000. Of these only 7,800 companies are listed of which only 4000 trade on the stock exchanges at BSE and NSE. Hence the stocks trading at the BSE and NSE account for only around 4% of the Indian economy, NSE was mainly set up to bring in transparency in the markets. Instead of trading membership being confined to a group of brokers, NSE ensured that anyone who was qualified, experienced, in this context, NSE was ahead of its times when it separated ownership and management in the exchange under SEBIs supervision. The price information which could earlier be accessed only by a handful of people could now be seen by a client in a location with the same ease. Jalandhar, formerly known as Jullundur in British India, is a city in the Doaba region of the northwestern Indian state of Punjab. Jalandhar is the oldest city in the Indian state of Punjab and is one of the oldest in the country, in recent times the city has undergone rapid urbanisation and has developed into a highly industrialised centre of commerce. Jalandhar has been shortlisted for the phase of the “Smart City” initiative of the Indian Government. Jalandhar used to be the capital of Punjab from India’s independence until Chandigarh was constructed in 1953, Jalandhar is situated alongside the Grand Trunk Road and is a well-connected rail and road junction. 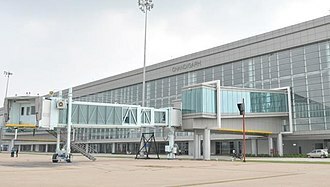 Jalandhar is 144 km northwest of Chandigarh, the capital of Punjab. The history of Jalandhar District comprises three periods — ancient and modern, the city is named after Jalandhara, a demon king, who is mentioned in the Puranas and Mahabharta. According to another legend, Jalandhar was the capital of the kingdom of Lava, according to another version Jalandhar is said to have derived its name from the vernacular term Jalandhar means area inside the water, i. e.
tract lying between the two rivers Satluj and Beas. 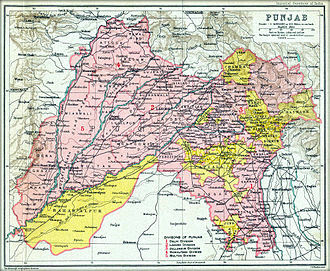 The whole of Punjab and the area of present Jalandhar District was part of the Indus Valley Civilization and Mohenjo-daro are the sites where remains of the Indus Valley Civilization have been found extensively. The archaeological explorations made during recent years have pushed the ancient times of Jalandhar District of Harappa period, the modern history of Jalandhar District states that Khilafat Movement was started in the district in early 1920 to bring pressure upon British rulers to change their policy towards Turkey. Mahatma Gandhi extended sympathy and support to this movement, Jalandhar District was declared Proclaimed Area under the Seditious Meetings Act. The city has a subtropical climate with cool winters and long. Summers last from April to June and winters from November to February, temperatures in the summer vary from average highs of around 48 °C to average lows of around 25 °C. Winter temperatures have highs of 19 °C to lows of −7 °C, the climate is dry on the whole, except during the brief southwest monsoon season during July and August. Ghaziabad is a city in the Indian state of Uttar Pradesh. It is sometimes referred to as the Gateway of UP because it is close to New Delhi and it is a part of the National Capital Region of Delhi. It is a large and planned city, with a population of 2,381,452. Recent construction works have led to the city being described by a City Mayors Foundation survey as the second fastest-growing in the world. Situated in the Upper Gangetic Plains, the city has two divisions separated by the Hindon River, Trans-Hindon on the west and Cis-Hindon on the east side. Excavations carried out at the mound of Kaseri, at the banks of river Hindon, according to the Gazetteer, the fort, Loni is named after Lavanasura. 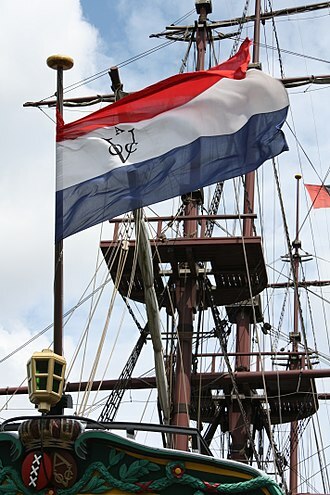 The city and its region have historically witnessed major wars. In AD1313, the region including present day Ghaziabad became a huge battlefield. During the Anglo- Maratha War, Sir General Lake and the Royal Maratha army fought here circa, altama Religion was started from Ghaziabad in 1803. The name Ghaziuddinnagar was shortened to its present form, i. e.
Ghaziabad with the opening of the Railways in 1864, establishment of the Scientific Society here, during the same period is considered as a milestone of the educational movement launched by Sir Syed Ahmad Khan. The Ghaziabad Municipality came into existence in 1868, the Sind and Delhi Railway, connecting Delhi and Lahore, up till Ambala through Ghaziabad was opened in the same year. The city of Ghaziabad was founded in AD1740 by Wazir Ghazi-ud-din, during the Mughal period and especially the banks of the Hindon in Ghaziabad, remained a picnic spot for the Mughal royal family. Ghaziabad, along with Meerut and Bulandshahr, remained one of the three Munsifis of the District, under the Meerut Civil Judgeship during most periods of the British Raj, Ghaziabad was associated with the Indian independence movement from the Indian Rebellion of 1857. During that rebellion, there were clashes between the British forces and Indian rebel sepoys on the banks of the Hindon, and the rebels checked the advancing British forces coming from Meerut. The Maan Mandir Palace at Gwalior Fort. Road in Saket A Block.